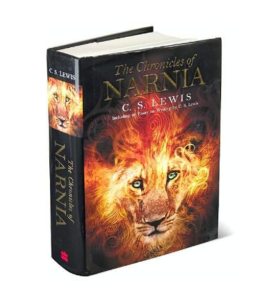 Do you think that The Chronicles of Narnia should be crowned as America’s best-loved novel? It’s now the final week to vote in The Great American Read on PBS. After five months and almost four million votes cast, C. S. Lewis’s classic series is currently ranked in the Top Ten from a list of one hundred books. The winner will be announced during the grand finale episode on October 23rd, but there’s still time to vote and help Narnia take the gold! – The Great American Read website (Search: “Narnia”). – Facebook or Twitter using the hashtag #VOTENarnia. – Texting #VoteNarnia to 97979. – Calling toll free at 1-855-443-6522. You may vote once per day with each of these voting methods. Voting is eligible to individuals in the United States and Canada. For more information, check out the How to Vote page. Remember, voting ends on October 18th at 11:59 pm PT, so the clock is ticking. #VoteNarnia and show the world that Aslan is on the move! That’s really cool! I’m kind of surprised actually. YEEEEESSS!! Narnia is getting so much positive press lately! Everyone vote as much as you can! Let’s do this! FOR NARNIA, AND FOR ASLAN!!!!!!!!!!!!!!!!!!!! For those of you who are torn about which books to vote for, you can vote for more than one a day. I approve of the top 10 list. Only Outlander is kind of an oddball. Has anyone here read it? Not me, but it’s a television show that’s airing right now so that might explain the strong showing. It stinks that I’m currently out of the country and the website won’t let me vote! What all made it to the top 10? Cleander: The Top Ten list is just in alphabetical order… nobody knows who is in the lead at this point! I actually like Charlotte’s Web just as much as Narnia. So I’m good. Oh. I would be really surprised if Charlotte’s Web won anyway. LOTR probably has the best chance. Thank you! I participated in the earlier voting for a while, but hadn’t found any way to see the results so far! Much as I love Narnia and LotR, it would be fun to have a book by an American author win, not HP, though. I wouldn’t want it to beat Narnia and LotR. My guess is that "To Kill a Mockingbird" or "Gone With the Wind" will win. Harry Potter isn’t American, it’s British. Cool. I Wasn’t expecting it to make it this far.